It’s true that we’re in the midst of the mobile era, but the latest data reveals that the golden age of mobile engagement may already be behind us. As reported by TechCrunch, overall app usage growth is up only 11 percent year-over-year, compared to 58 percent in 2015. True, usage is still growing — but slow growth is a sign that there’s a mismatch between the supply of apps and the demand of user attention. Each year brings us countless new apps, but they must compete for stagnating levels of attention. What’s more, reports continue to show that app revenues are unevenly concentrated among a few top winners. App Annie reports that gaming alone accounts for 75 of overall revenue on iOS and 90 percent on Android. Average Revenue Per User (ARPU) also increased significantly, but most of this growth was driven by Japan and China. 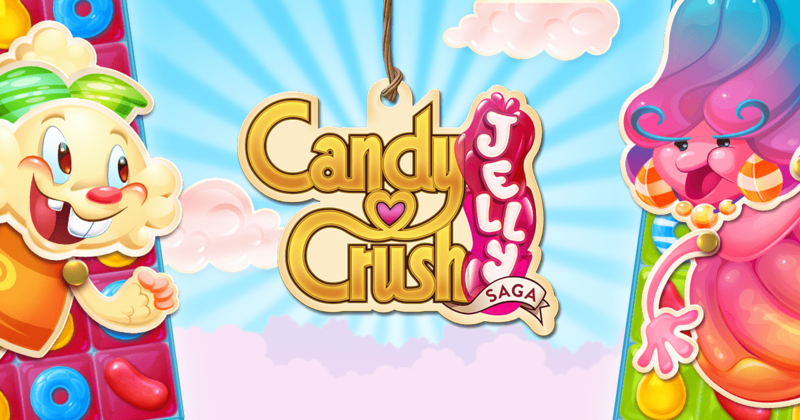 Japan’s top 30 games are monetized twice as effectively as the top 30 in the US. 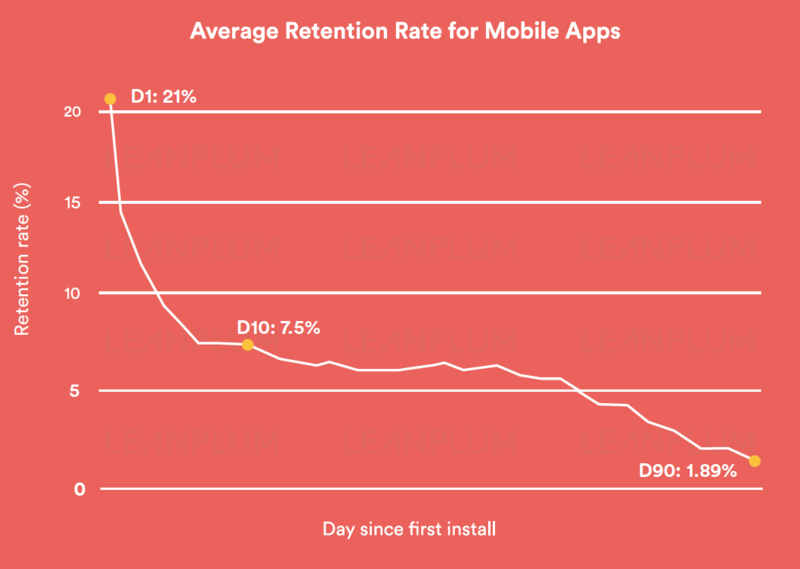 Achieving a greater app engagement rate isn’t a matter of luck or fate. Some of the best app publishers are using data to quantitatively grow their app engagement, even if aggregate engagement rates are stagnant. How is this possible? It’s all thanks to mobile marketing tools. With the right platform and the right process, app teams can use simple marketing techniques to drive better results than ever before. Let’s find out how. When it comes to inexpensive marketing channels, it’s hard to beat mobile messaging. A well-timed push notification can lead to conversions just as effectively as discounts can. If your goal is to increase app engagement, push notifications stand out from the crowd. A Leanplum push notification study found that messages that contain personalized content experience a 4x higher open rate, while those that are sent by behavioral triggers enjoy 8x more opens. These numbers are significant; with the right push notification campaign, you can bring a far larger percentage of your audience back into the app. Yes, acquisition still matters — but it’s a less valuable metric when you don’t take retention into account. Traditionally, mobile teams tried to acquire new users as quickly as possible, in the hopes of driving viral growth. In doing so, the high download numbers would push the app to the top of the App Store rankings, resulting in a virtuous cycle. But in today’s world of skyrocketing acquisition costs and a saturated App Store, this strategy is getting harder and harder. 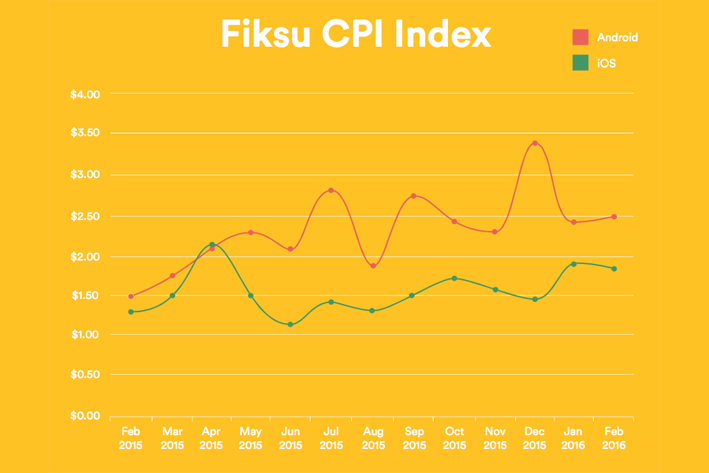 Look at the acquisition costs below, as pulled from Fiksu. Yet despite the high cost of user acquisition, retention remains abysmally low. In fact, by day one, you’ve lost 21 percent of your users. By day 90, you’ve lost just over 98 percent. When the cost of acquisition is so high, you must make room in your marketing budget for retention. As a guideline, we suggest that app publishers aim to spend no more than 25 percent of a customer’s lifetime value (LTV) on acquisition. This means that if your average customer acquisition cost (CAC) is $4, your LTV should be no less than $16. Sometimes it’s easier to improve this ratio by optimizing your customer acquisition. But because acquisition is determined by several factors beyond your control (changes to App Store/search engine algorithms, competition from other ad buyers), this isn’t always possible. This is where spending on SaaS engagement tools like Leanplum pays off. With personalized messaging and behavior-based lifecycle campaigns, it’s possible to increase LTV enough to offset the rising CAC. The optimizations don’t stop there. 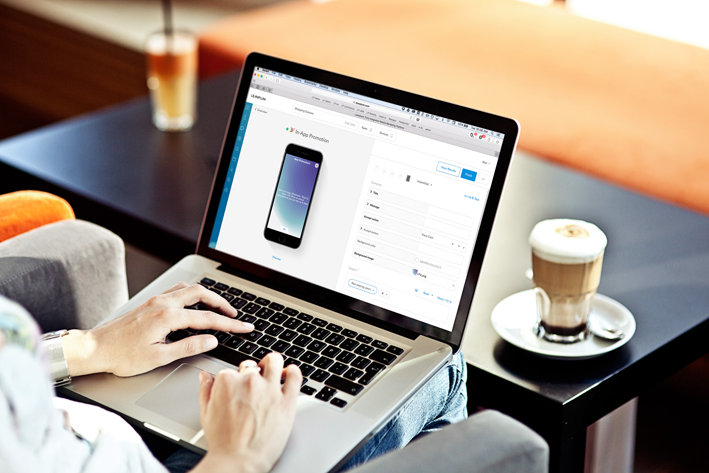 In addition to messaging, Leanplum enables mobile A/B testing for in-app elements in order to provide a fundamentally more engaging experience. Teams can also use the App Editor to make direct changes to the app UI, enabling a faster feedback loop with no App Store resubmissions. If you continue to spend relentlessly on acquisition, you risk losing the majority of your spend to churned users. And if you overspend on retention, your app might never hit the numbers it needs for viral, organic growth, and you’ll be forced to squeeze more profit out of fewer users. The best solution is to keep the two in relative balance. App engagement isn’t an abstract goal. It’s measurable based on the decisions that users make in your app — and it’s directly tied to revenue. The magic formula has always been that the customer acquisition cost (CAC) should be less than the customer’s lifetime value (LTV), as explained above. So long as this is the case, you know that each new user is adding to your top line, even if profit margins are small. But if you break down LTV even further, it comes out to Number of Days Retained * Average Revenue per Daily User. If higher engagement leads to more conversions, revenue per user will increase. And with better retention rates, you’ll have more daily users. In other words, both engagement and retention play directly into LTV. As we found in our Retention Revealed data science report, sending push notifications during the user’s first 30 days increases retention by 1.5 percent. This number sounds small in isolation, but it’s more meaningful when you realize that it factors directly into ROI. Over the course of time, even a single push notification can end up increasing your retention by 20 percent. And if you personalize those messages to speak to your audience on a deeper level, you can increase retention by 7x. Good CSMs are product experts. They have practical experience in creating campaigns for a variety of app verticals, and they’ve likely worked with clients of many different sizes. With these traits combined, customer success managers are uniquely positioned to offer guidance specific to your business and their solution. 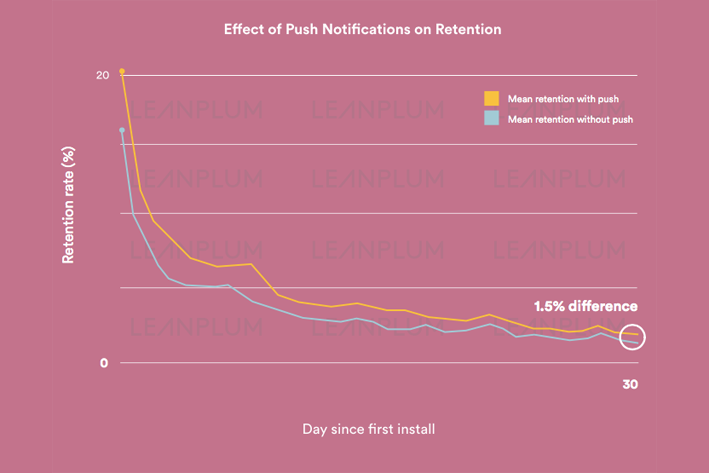 At Leanplum, our push notification campaigns have grown increasingly effective. With our new growth campaign suggestions, we expect many customers to surpass the expected 1.5 percent increase in 30-day retention. Our CSM team is comprised of mobile experts; they have the know-how to take campaigns to the next level. For the skeptics among us, here are a couple testimonials we’ve received from clients over the years. “Leanplum’s customer success team saves us internal resources, so we can focus on growth and retention strategies. Beyond the great technology, we get an added mobile expert on our team — all included as part of the service” — Erno Tauriainen, CEO and Founder of Spent. “I’ve had a great experience with the Leanplum customer success team. It was late at night and I had to create a campaign for the next day. I had questions that couldn’t wait and I sent a message to the Leanplum customer success team, hoping they would respond to me early in the morning. I was very surprised when I got the message back in a few minutes” — Fabiana Azevedo, Product Manager, Mobile Growth at Hotwire. Product matters, but an expert CSM team helps clients extract more value from the product. Leverage this advantage when you sign a contract for a new solution. What Will 2017 Look Like for Mobile App Publishers? 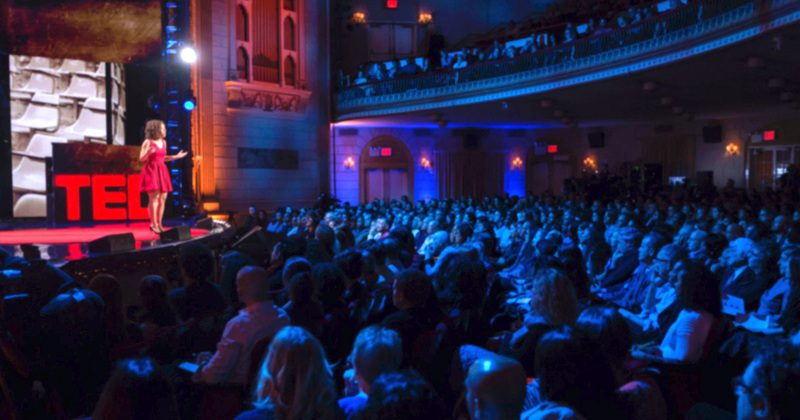 If 2016’s trends continue into this year, user attention will become even scarcer. 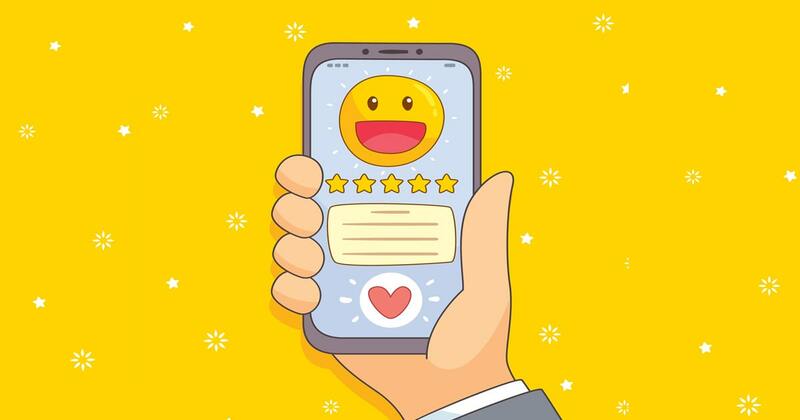 The inability of new apps to earn their spot on the user’s home screen without burning cash on advertising will encourage a better balance between acquisition and retention. The age of easy acquisition is over. The best mobile teams are ahead of the curve; they’re already redirecting attention to engagement and retention. In 2017, it will take more than optimized ads to keep acquisition profitable.